Noshok® series 300 pressure transducers focus on ruggedness and long term stability, are RoHS compliant, and have technical specifications exceeding those of transducers that cost much more. They are commonly used for hydraulics & pneumatics, pumps & compressors, stamping and forming presses, test equipment and systems, and industrial machinery and machine tools. 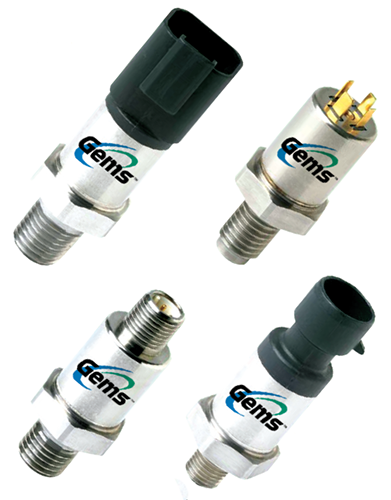 Gems® series 809 pressure trasmitters operate on low-cost, unregulated DC power, and over a wide temperature band with both liquids and gases. Designed for harsh environments, they are suitable for use in high shock and vibration applications. They are commonly used for hydraulic systems, compressor control, HVAC/R equipment, industrial engines, process and containerized refrigeration systems, and industrial OEM equipment. Noshok® series 650 pressure transducers combine high performance with off road vehicle reliability under severe process and environmental conditions. They are commonly used for hydraulics & pneumatics, pumps & compressors, off road vehicles, refrigeration controls, and industrial machinery and machine tools.